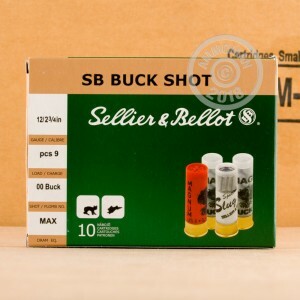 This case of 250 Sellier & Bellot shotshells is the perfect choice for a fun afternoon or two of blasting away while keeping your costs down. 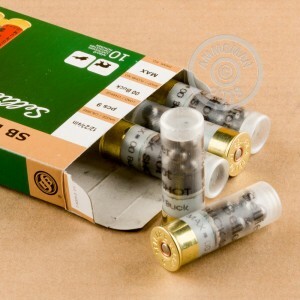 These 2 3/4" shells use 9 pellets of 00 buck and are suitable for target use as well as hunting and self-defense. 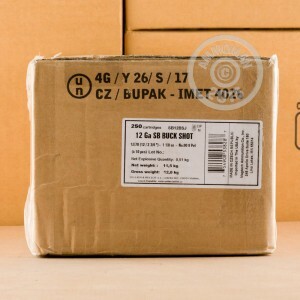 S&B ammunition comes from the Czech Republic; the company enjoys a strong reputation for making ammo to Western standards and has operated for well over a century. 00 buck is the most common shotgun pellet size and is commonly used for hunting midsize game such as deer (hence the name "buckshot"), and for self-defense. AmmoMan.com ships all orders over $99 for free. The price you see here is the one you get, with no extra fees! It's our way of thanking customers who choose us for their high volume shooting needs. Nice rounds for small game. Ran well in my Benelli and had zero issues. Great deal. I have ordered quite a bit of this buckshot and used the hell out of it destroying things like empty oil drums and the like when I had a Saiga 12 gauge semi auto "AK" style shotgun. I also actually used it for close range hunting of coyotes I would call in with a "distressed rabbit"call. It patterns perfectly, hits hard and is well charged with powder judging by the recoil. And for the price.........why pay anyone more? In short, this is a great buckshot round and each round shoots just like its predecessor so it is supremely uniform load round to round.......and it tears the heck out of both oil drums and coyotes......and is inexpensive and burns VERY cleanly. Worked great in my Benelli. My Benelli is ammo sensitive but this functioned reliably.